Hiking newbies who want to enjoy a fantastic hiking activity in a flat, moderate trail, are sure to find great hiking trails in Branson that are suitable for them. So get ready to grab your most comfy pair of rubber shoes and explore some of the best hiking trails in Branson that offer hikers picturesque views of Branson and some flora and fauna. Whether you just want to enjoy a simple day hike, energize yourself with a nice bike ride or enjoy a fascinating horseback ride adventure, Branson is the place to go as it features more than 200 miles of easily accessible public trails that offer ample options for outdoor fun . Before you start a hiking adventure in Branson, be sure you are dressed comfortably, have the proper gear and ensure you’ve got plenty of water – taking more than you think you’ll need is not a bad idea. Be sure not to forget bug repellent and sunscreen as bug bites and sun burns can ruin your otherwise enjoyable hiking adventure in Branson. Some of the popular hiking venues in Branson that are easily accessible include the Ruth and Paul Henning Conservation Area and the Dogwood Canyon Nature Park. Ruth and Paul Henning Conservation Area is home to some 5 fantastic trails that include Dewey Bald, Glade Exploration Trail, Steamside Trail, Shane’s Shortcut Trail, and Homesteader’s Trail that course through the heavily-forested areas of the vast land. The Dewey Bald Trail is the first trail that hikers can reach in the area. Stretching only 0.4 mile in length, this paved uphill trail is ideal for beginners and will lead to a 40-foot observation tower that offers panoramic view of Branson’s landscape. The 1.1 mile Glade Exploration Trail offers easy and moderate hike. The Steamside Trail that spans only 0.4 mile features easy and moderate trail to hike. The Shane’s Short Trail which also has a length of 0.4 mile is a bit more difficult to hike. The Homesteader’s Trail which has a length of 3.4 miles long is the most difficult trail with a hiking time of 3 hours. When you take a hiking adventure at the Henning Conservation Area, you will see Roark Creek which covers 1,100 acres of forest, a great place for bird-watching. Roark Creek is designated as an import bird area. 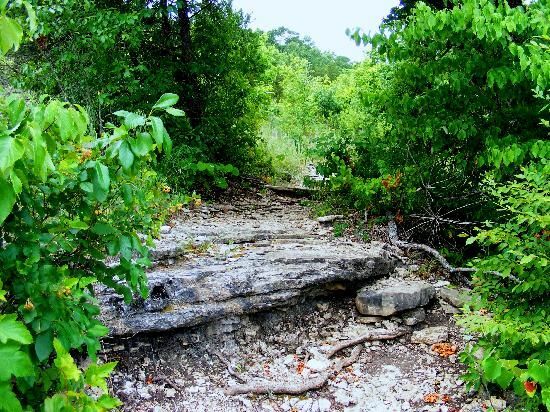 Dogwood Canyon Nature Park is another great place to enjoy fascinating hiking adventure. About 40-minute drive from downtown Branson, Dogwood Canyon offers many things for outdoor enthusiasts, including hiking, mountain biking, or even horse-back riding. Overall, Dogwood Canyon covers an area of about 10,000 acres, so it’s a vast space for every adventurer to roam and relax. No matter what fun activity you choose, you are sure to enjoy the park’s beautiful natural scenery, waterfalls, stone bridges, and crystal clear waters filled with brown and rainbow trout. Ruth and Paul Henning Conservation Area and Dogwood Canyon Nature Park are some of the best hiking trails in Branson that offer easy hiking adventure for newbies.